In 2000, I published an article, “To Disturb the Assembly: Tarleton’s Charlottesville Raid and the British Invasion of Virginia, 1781”. This article originally appeared in the Autumn 2000 issue of Virginia Cavalcade magazine, the quarterly illustrated magazine of Virginia history and culture published by the Library of Virginia. Unfortunately, due to state budget cuts, this magazine is no longer published. Since the article is not readily available to many folks, I have reprinted the text below, but if you are interested in this subject, I would recommend trying to get a copy through ILL, as the magazine included several fine color illustrations including Reynold’s famous portrait of BT. All rights reserved. Used by permission. © 2000 by the Library of Virginia. To Disturb the Assembly: Tarleton’s Charlottesville Raid and the British Invasion of Virginia, 1781. A desperate Lafayette begged Steuben to persuade the General Assembly to supply fresh horses. “If they do not,” he said, “it is impossible we can defend this country.” On 24 May, the marquis wrote presciently to Greene, “The Ennemy’s Cavalry and Mounted Infantry Are So Numerous that we Cannot Guard Against partizan Strokes.” Only fifty, ill-equipped mounted troopers were then in the marquis’s command; as he succinctly observed, “Cavalry is everything in Virginia.” Jefferson agreed with the consensus and directed all county lieutenants in Virginia to remove riding and draft horses from the path of the British troops. On 28 May, the House of Delegates advised the governor to authorize Lafayette to impress the necessary animals. Lafayette met with limited success, telling Jefferson that “all the fine Horses in the Country are falling into the Enemy’s hands.” He blamed the owners’ unwillingness to move the animals out of Cornwallis’s path and the impressing parties’ difficulty in operating around the British forces. On 30 May, Steuben opined to Lafayette, “I am of the opinion that my 500 men, and even if it were 1,000, together with those you have, would not prevent Cornwallis from advancing or going wherever he pleases.” Steuben’s premise proved entirely correct. Significantly outnumbered by the invading redcoats, the French marquis kept his thin units at a wary, respectful distance to the north and west of Cornwallis. The British battalions steadily marched towards Fredericksburg, and Cornwallis reached the North Anna River at Cook’s Ford on 1 June. Lafayette arrived at Mattaponi Church the next day. The British thrust appeared to be in preparation for an attack on Fredericksburg, site of a small arms manufactory, and Hunter’s Iron Works, a valuable foundry at Falmouth. With little opposition, the British campaign was demoralizing the rebels in Virginia. Cornwallis had “thrown every thing into great confusion, as well as filled the minds of the people with the greatest discontent,” wrote an apprehensive Virginia officer, Colonel William Davies, on 2 June. The British also sought to prevent reinforcements in Pennsylvania under Wayne from reaching Lafayette, as the patriots intended. Lafayette, however, was too quick for Cornwallis, who abandoned any further moves to the north in pursuit of him. Though Tarleton’s stalwart troopers raided near Bowling Green, Cornwallis recognized his inability to catch the fleet-footed Americans and bring them to battle. He halted his advance at Cook’s Ford and altered his line of march. “From what I could learn of the present state of Hunter’s iron manufactory,” he reported later to Clinton, “it did not appear of so much importance as the stores on the other [western] side of the country, and it was impossible to prevent the junction between the Marquis and Wayne.” Fredericksburg now appeared safe, but Lafayette had left the western part of Virginia defenseless. Cornwallis intended the much-feared cavalry officer to make a lightning-quick, hard-hitting “partizan stroke” and destroy supplies and war materiel in a westward dash on Charlottesville. At the same time, Simcoe and the Queen’s Rangers would ride southwest to destroy the patriots’ depot at Point of Fork. 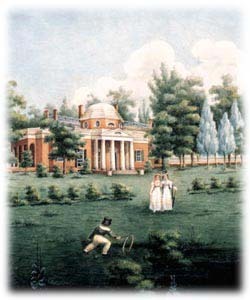 Tarleton’s mission included the alluring assignment of not only breaking up the legislature, but also capturing Governor Jefferson, who was presiding over the assembly at the time and residing at his mountaintop home, Monticello. While Tarleton and the cavalry galloped off to wreak havoc upon Virginia’s lawmakers and precious military supplies, Cornwallis intended to follow Simcoe’s path. He planned to move the bulk of his army via the Ground Squirrel Bridge on the South Anna River, through Goochland County to Jefferson’s Elk Hill plantation, on the north bank of the James River, several miles east of Point of Fork. There he would rendezvous with Tarleton and Simcoe. During this time of disturbance, few delegates bothered to attend sessions of the General Assembly. Not until 28 May could the reconvened assembly manage a quorum, when it probably met at the old Albemarle County courthouse. “We all fixed ourselves very comfortably, in full Assurance of being unmolested by the Enemy,” wrote one young delegate, John Breckenridge, of Botetourt County, to his mother. The traveling legislature, which included Patrick Henry, intended to elect a new governor to replace the outgoing Jefferson, whose term expired on 1 June. Early on the morning of 3 June 1781, the confident, audacious Tarleton rode out of Cornwallis’s camp on the North Anna River, hoping to surprise the Virginia government sixty miles to the west. The British column packed a punch. Although they suffered “the utmost distress for want of arms, cloathing, boots, and indeed appointments of all kinds,” as Cornwallis told Clinton, Tarleton’s men were hardened veterans. To strengthen the legion, Cornwallis first directed Tarleton to take along a contingent of mounted infantry of the 2nd Battalion, 71st Highlanders. The officers of that battalion, however, vehemently protested this duty, as they thought Tarleton had carelessly squandered several companies of the 71st’s 1st Battalion in his defeat at Cowpens. Tarleton instead received a company of the 23rd Regiment, Royal Welch Fusiliers to ride behind his troopers and add additional firepower. The total force comprised 180 dragoons and seventy mounted infantry. Tarleton’s column initially followed the North Anna on the south bank in Hanover County. They proceeded through Brown’s Ordinary in western Hanover at dawn, following the main road that led to the Ground Squirrel Bridge. The soldiers behaved themselves, although many fearful residents “buried their most valuable effects” to hide them from the enemy, reported Robert Honyman. Once across the South Anna River, Tarleton turned west and entered Louisa County on the road to the courthouse. The troopers rested only once, at noon, due to the heat. While Tarleton handled operations in the Charlottesville area, Simcoe’s mounted column of Loyalist cavalry captured and destroyed large quantities of valuable American supplies at Point of Fork, Steuben’s main supply point, on 5 June. While Simcoe’s men destroyed the supplies, Steuben beat a hasty and humiliating retreat south of the James. Cornwallis set up camp at Elk Hill on 7 June. Only partially successful due to the escape of most of his intended quarry, Tarleton left Charlottesville after a few days and led his column and prisoners down the Rivanna River to Elk Hill. There, Tarleton paroled most of his captives, including Daniel Boone, but he retained those whom he considered lower class—lacking wealth or position—as prisoners of war. The swift, unexpected, and destructive procession of the much-feared Tarleton and his troopers through the rolling hills of the Virginia piedmont created a chaotic situation for the region’s inhabitants and the military officers attempting to combat him. Although some members of Albemarle’s militia turned out upon word of the raid, they did not attack the British regulars in Charlottesville. Rumors of Tarleton’s movements abounded, and reliable information was in short supply. On 5 June, writing to Greene, who was no doubt anxious for intelligence from Virginia, Captain John Pryor, at Buckingham Court House, advised him of the “late operations of the Enemy.” Pryor noted that Steuben would have had no time to write. Pryor was sure that “many of the Members of the Assembly are taken at Charlottesville where the Assembly were sitting,” and that some may have “previously adjourn’d” to another site. As late as 9 June, Greene, in South Carolina, continued to urge Lafayette not to “spare any pains to remove all the public Stores out of the enemies way.” “I am exceedingly distressed to find it altogether out of my power to give you the support your situation claims and my inclinations lead to,” wrote the southern commander. As it turned out, Lafayette was unable to report the attack on Charlottesville and Point of Fork to Greene until 18 June. He succinctly described the losses as “trifling” a few days later. “Upon the whole,” he wrote to Greene on 20 June, “our loss was not very Considerable But will Show [a] great deal in Newspapers.” Steuben lost complete contact with Lafayette for more than a month. Military operations in Virginia to counter Tarleton’s column were confused and ineffective for weeks after the British left Charlottesville. Rumors of Tarleton thundering over the Blue Ridge into Augusta County to try again to capture the assembly caused great commotion in Staunton, which the fleeing delegates had reached by 7 June.In Staunton and beyond, acrimonious debate and harsh accusations about Jefferson followed the alarm of Cornwallis’s operations. A party of delegates tried to censure Jefferson once the assembly reconvened at Staunton, for alleged derelict conduct in protecting the state during repeated British incursions. The legislature had failed to elect a new governor by the time Tarleton’s troopers rode into Charlottesville, thus adding to the confusion and leaving the commonwealth without a chief executive until the election of Brigadier General Thomas Nelson Jr. on 12 June. A few delegates, mostly supporters of Patrick Henry, called for an inquiry into Jefferson’s conduct during the previous year, which had seen several British incursions into the state. Late in 1781, the assembly completely exonerated Jefferson. During his presidency two decades later, political enemies vigorously renewed the charges, which Jefferson bitterly remembered. As the assembly gathered in Staunton, militia companies of frontier riflemen from Augusta County assembled at Rockfish Gap to defend the Shenandoah Valley. From Staunton, Colonel William Davies [pictured below] echoed a familiar refrain when he wrote to Greene, “The enemy have at length driven us over the mountains; their superiority in cavalry is so great that there is scarcely any security below.” The local militia responded to calls to arms by Virginia officers, but “at least twice as many militia are taking the field as are necessary,” Davies lamented. He feared that as soon as the harvest began and the volunteers grew tired of service, the forces would shrink to “a very small handful.” In the end, they never had to fight, for Tarleton’s troopers ventured only a few miles west of Charlottesville and never attempted to cross the Blue Ridge. While Tarleton, Simcoe, and their hard-riding troops ravaged Virginia’s supplies and disrupted its government, Lafayette did not intervene. Lacking cavalry and still awaiting the arrival of Wayne’s Continentals, who were on the march to Virginia from York, Pennsylvania, the marquis prudently decided to receive reinforcements before aggressively attempting to oppose Cornwallis. Wayne’s regiments, in excellent spirits, reached Lafayette’s position near Raccoon Ford on the Rapidan River on 9 June. On 13 June, an American scout captured the dispatch Tarleton had written to Cornwallis reporting his raid on Charlottesville. This paper was published promptly to warn local residents of the potential danger they faced should Tarleton come their way. With rebel skirmishers at his heels, Cornwallis and his reunited army began their march south along the north bank of the James on 15 June, with the vanguard of his forces arriving near Richmond the next day. As the long column of redcoats trudged along the dusty roads of Virginia to Yorktown, the beleaguered General Assembly in Staunton voted to honor one of the few patriot heroes of the campaign. On 15 June, the lawmakers directed Governor Nelson “to present to Captain John Jouett an elegant sword, and pair of pistols, as a memorial of the high sense, which the General assembly entertain; of his activity, and enterprize in watching the motions of the Enemy’s Cavalry on their late incursion to Charlottesville, and conveying to the Assembly timely information of their approach, whereby the designs of the Enemy were frustrated, and many valuable stores preserved.” The hero received the French-made pistols in 1783 and the sword in 1803. Tarleton had one more escapade in store for Virginia. For sixteen days in July, he and his troops galloped in a round trip from Suffolk to Petersburg, Amelia Court House, Prince Edward Court House, Charlotte, New London, and Bedford. They stole fine horses and destroyed supplies while fending off the Virginia militia. The cavalry leader covered thirty to forty miles a day but lost many soldiers and mounts to the summer heat. In late August, he joined Cornwallis at Gloucester and Yorktown. Tarleton’s last battle of the American Revolution came on 3 October 1781. During a skirmish at the Hook in Gloucester County, he was unhorsed and injured but escaped capture by French forces. When Cornwallis surrendered to Washington at Yorktown on 19 October, Tarleton surrendered to Brigadier General Claude-Gabriel de Choisy at Gloucester. He felt in danger for his life and sought protection from French officers after his parole. American officers refused him the invitations to socialize that they extended to Cornwallis and other British officers. Tarleton arrived in London, a hero, on 18 January 1782. His stock might have risen even higher had he captured Thomas Jefferson and the entire General Assembly of Virginia. If not for a stop at a country tavern, the happenstance presence of an alert militiaman, and the dramatic nighttime journey of Jack Jouett, Tarleton would have counted a huge coup for the British, struck a terrible blow to the morale of Virginians, and, perhaps, changed the outcome of the Revolutionary War. Tarleton’s Obituary in Gentleman’s Magazine, 1833, can be found here. Thanks so much for making this available! It is a good read. Actually, it’s Charles, Lord Cornwallis. Cornwallis is part of his title, not his “last name”. Thank you very much for making this piece available. Do you know where to get a higher res picture of Reynold’s famous portrait? I’d really like to include it in my screensaver. My 5-G Grandfather, Christopher Eye was in the Augusta,Va. Militia, cavalry troop, 2nd Battalion, and fought in the Yorktown campaign. Your blog really made history come alive. Thank you. wow! i live rigth off of hook road in gloucester. very interesting story. 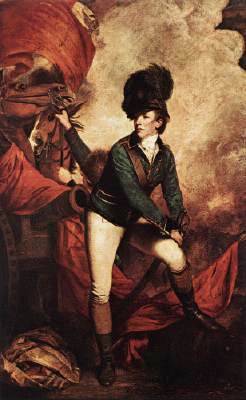 Do you know where can I find pictures of Sir Banastre Tarleton wearing the British uniform? Ty for answered me, I appreciate it. But what I’m looking for is and image were the british officcer uniform is shown, cause my kid is on a playing for his school and I’m trying to find a model to make his costume. Go to the website called “Oatmeal for the Foxhounds,” and click the link for images. There are plenty of them there with BT wearing a green coat and one with a red coat. Both are British officer coats! Very informative. Since today is July 4th, I just watched a very long show about The Revolutionary War where he was mentioned in considerable detail. Great site. Or more men like Tarleton would have further aroused the populace of America to fight. One does not know…. I love to know about history. This is a wonderful post. I am very glad to read this..
I’m writing a novel about the last year of the revolutionary war, and here in Germany it is hard to find information to this period of history; in fact, Robert Bass’ “The green Dragoon” was my introduction as ‘Tarletonian’. To read your fine article about Tarleton’s raid gave me perfect new aspects to my story and encourages me to go on researching. Thank you! If you would like a copy of the article in the magazine, I can send you one. Do you have copies of your article on Banestre Tarleton available for sale? I would like to have a hardcopy. Are you by chance also a Tarleton? Robert Tarleton of Mobile Alabama. The family lost it along the way but just now I googled and found it in paperback. I believe I have 1 or 2 left. Please contact me at johnmaass23@verizon.net for more details….